SKF NOTE: I remembered interviewing Sheila E., but where and why had escaped me. That is, until I was thumbing through my October 1985 CREEM magazine last night. Why had I even kept that single copy of CREEM for 32 years? I couldn’t imagine. Well, it includes my Shiela E. profile. And it also includes CREEM‘s 1985 Drum Supplement – on which I will post and comment another time. 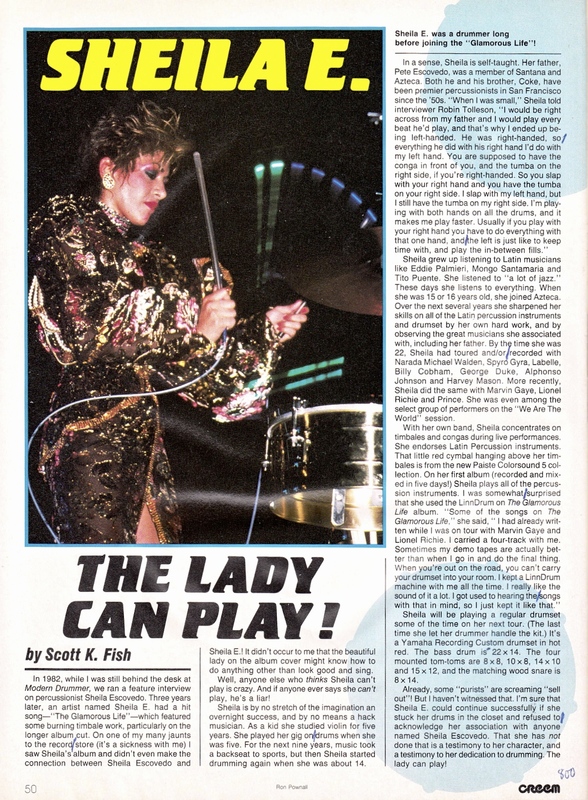 For the moment, I’ll just say, now I know why I saved this issue of CREEM: Shiela E. and the ’85 Drum Supplement. Of the two, Shiela E. is the positive memory. The Drum Supplement is a lesson learned. As a side note – the vertical blue ballpoint pen markings are a pre-computer word count. The 800 written in the lower right corner of the magazine page is the total word count for the Shiela E. profile. When magazine’s paid me X amount per published word, I would count the words, make a vertical mark every 100 words, total the vertical marks, multiply by 100 — and that’s the published word count I used on my invoice to magazines. Without the vertical marks it was easy to lose track and have to start again counting words from the beginning. This entry was posted in SKF Blog and tagged CREEM, Drummer, Scott K Fish, Shiela E. Bookmark the permalink.